Have you heard that NASA’s Mars Reconnaissance Orbiter has discovered flowing water on Mars!? And where their is water there is possibly life! And if their is life on Mars what does this say about the origins of life in our Universe? The possibilities for debates between American scientists and theologians will be endless. NASA would like to investigate further and of course goes to great lengths to make sure that its surface probes are free of any microbial spores before they land on Mars lest they contaminate the very planet on which they are seeking life. But Of course accidents do happen and should life be discovered on Mars by the nearest NASA land probe to the possible water source on Mars, within the next few months say, you know what that will mean? Somehow poor Hillary is going to have an awful lot of explaining to do… to an awful lot of Republican committees! American citizens (along with other international students) can now attend all German universities…for free! 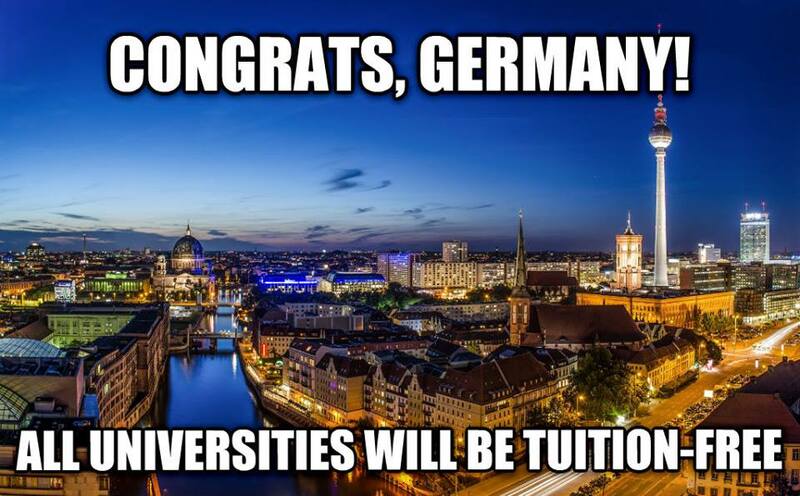 And that’s because the last German state to charge university tuition has eliminated those fees! Wow! How do they do it? College for free? And for foreigners too? Didn’t we go to war with this country… and win… 70 years ago? Shouldn’t we be charging them money to go to our universities? And so much so that school is free for all of us Americans? You know, like that wall Donald trump wants to build and make the Mexicans pay for. So what gives? Why is Germany being so nice to us and how can they afford it? Apparently most German statesmen and stateswomen believe that tuition fees are unjust and that they discourage young people, who do not have a traditional academic family background, from taking up study. Gee, In the Unites States that’s the whole point of higher education isn’t it?… To separate the haves from their money while also separating them from the have-nots, who don’t have any money to be separated from in the first place. The Germans also believe that It is a core task of politics to ensure that young women and men can study with a high quality standard that is free of charge. For goodness sake where did they get these ideas? In the U.S. the core task of politics is to raise the interest rate on student loans while making sure that those loans are exempt from bankruptcy filings guaranteeing that America’s young students will be in debt to financial institutions for all time…and so far to the tune of over 1 trillion dollars! And get this! Even before Germany abolished college tuition for all students, typical semester fees were around $630 and German students could also count on discounts for food, clothing, events, and inexpensive or even free transportation to and from school…Come to think of it we used to do that here in the states too, back in the 70s. I remember that because I was there! But then we got wise and realized that marketing to students, teenagers and even little kids is tremendously lucrative, especially when they have to borrow all of their money from adults! It was like taking candy from babies! or, er, well, selling candy to babies! And today we are all proud to say that the average student loan debt in the U.S. is now almost 30 thousand dollars…with a bullet! Silly Germans! What are they thinking? Have they gone socialist on us…in just 70 years? We sure didn’t indoctrinate those folks very well did we? They never learned anything about free enterprise and unfettered capitalism! Now they are just giving valuable educations… to their children…for free?! And they want to include our children as well!! Ach, du lieber! Mein Kampf! When they ask your children what language they’d like to study in high School, make sure you tell them to say, German! Duh, I mean Deutsch! And forget that college savings plan. Just start booking those tickets now! This is America, remember?! By next year a ticket from here to Germany will probably cost $100,000!!! One way! It’s getting very hard to follow the Republican Candidates for president of the United States. It seems as though they are using some form of Republican “New-speak” or rather a language that their Republican base can understand but that leaves the rest of us scratching our heads and wondering how they can fit both of their feet in their mouths at the same time. Yesterday Jeb Bush said that the United States is “creeping toward multiculturalism” and described it as “the wrong approach.” Yet Jeb Bush has a wife who is Mexican by birth and he himself speaks fluent Spanish and embraces Spanish cuisine like Guacamole…but then again who doesn’t…like guacamole that is? America is Multi-cultural isn’t it? Hasn’t it always been? So what kind of multi-multiculturalism are we creeping toward that isn’t good for us? And who is the good governor talking to when he says that? Perhaps he was addressing those among his party who see modern day immigrants to this country as threatening…even though we pride ourselves on being a “nation of immigrants.” Could it be the “kind of immigrant” that you are that matters? The day before that, presidential candidate, Dr. Ben Carson, said that Islam and the Presidency of the United States would not make a good fit, as in, a Muslim would not make a good president. Said Dr. Carson, “I would not advocate that we put a Muslim in charge of this nation. I absolutely would not agree with that”. Of course everyone knows that our constitution in no way specifies what religion a President of the United States can and can’t be. He simply must be of age and an American citizen. So what was the good doctor talking about and who was he talking to? Could it be that he was speaking to the 40% of Republican voters who already think that we have a Muslim president…who by the way, they hate? And how about Senator Rafael Ted Cruz (that’s his Christian name) who was born in Canada?! And his father was born in Cuba! And no Republican has any problem with his running for president? Yet President Barry (His nickname, as in Ted) Obama, was supposed to prove that he was an American citizen even though he actually was born in the USA!? So what is it with these Republican candidates who, as well educated and intelligent human beings, know better than to say the things that keep coming out of their mouths? No wonder “The Donald” is leading in all of the Republican polls. He’s the only one who is speaking in “American” and not “Double-speak” or “New-speak”, so that we all can hear the message loud and clear… It’s all about hate and fear and prejudice and wanting to go home again to the America of the 1950s where civil rights and civil liberties and feminism had yet to rear their ugly heads. So I guess that all you have to do is put on your ruby slippers America and repeat after those candidates for the Republican nomination for the presidency:…”There’s no place like home, There’s no place like home, There’s no place like home.” But when you wake up next year, guess what? It’s going to be 2016…whether you like it or not, and this kind of 20th Century Fox nonsense isn’t going to help anybody solve our 21st century problems. When Jeb Bush was asked which woman from American history should appear on the new ten dollar bill he answered, “Margaret Thatcher.” He said that was because she worked so well with president Ronald Reagan who is considered by most Republicans to have been the greatest president who ever lived. 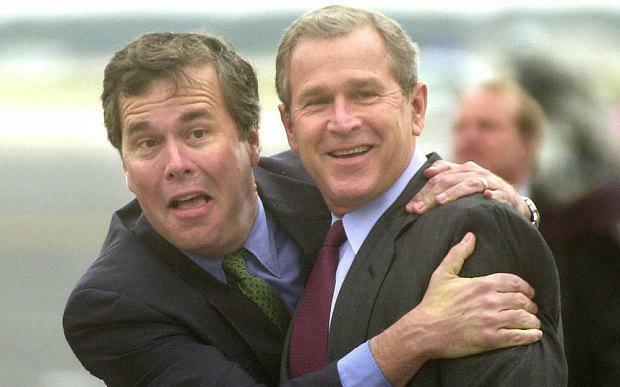 So great apparently is Jeb Bush’s love for the former president that he can’t even think of one woman from the United States’ glorious historic past…or present… who could possibly represent the United States on its 10 dollar bill…not one! All he can think of is an English woman who supported and mirrored President Reagan’s policies while she was the Prime Minister of Great Britain! Mr. Bush added that it probably would be illegal and not allowed, but Margaret Thatcher would be his choice for the tenner. Wow! That’s quite a bro-mance wouldn’t you say? They say that some people see stars in their eyes when they’re in love but…I guess if your a woman who is an American citizen then there’s probably not much that you can do to attract the good governor’s attention… for he’s got eyes for someone else…probably not even if you vote for him! What is it about rich folks? They never use drugs…especially marijuana. They just tried it once a long time ago because they were sad or lonely and then realized that it was wrong, or not for them or they simply didn’t like it and then never ever ever used that demon weed again. It’s always the same story. It’s just amazing how wealth somehow is the antidote for marijuana use. I guess that’s why we never see very many wealthy cannabis users go to jail. Everyone knows that drugs, and especially marijuana, are for black people and poor white folks. Those are the kinds of people who just seem to love drugs as though they were their very best friends. I guess that’s why we have about 1 million poor and mostly black people in prison for marijuana use or possession. It’s so bad that we have to stop and frisk these people right out on the public streets just to save them from themselves, then send them to jail to teach them a lesson. Otherwise they would never learn or know any better. Whereas if you send a child to a college or university that costs thousands of dollars to attend and then surround them with a never ending supply of marijuana and other drugs of differing varieties and ilks…nothing happens. They somehow become immune to the drugs addictive effects that an otherwise poorer more colorful person would succumb to. We don’t even have to bother to stop and frisk folks on college campuses because we simply know this to be true. And even though statistics, research and surveys tell us that white and/or wealthy folks use, sell and distribute marijuana at the same rates and percentages that everyone else does, including black folks, for some reason its the black folks that end up in jail at 3 to 10 times the arrest and conviction rate of white people…depending on where they live. And where is the best place to live, if you want to avoid going to jail for marijuana use? In a rich white person’s house of course…because whenever we try it we always go, “Puh! That’s just not for me! And I swear mom that I’ll never do it again. I guess the devil made me do it.”…and that’s the end of it. It’s like some how affluence is the cure! It’s very strange but that’s how it always seems to happen. In fact statistics also show that if we could somehow make everyone in this country either rich or white or better yet, both, our country’s cannabis problem would disappear over night…and those ma’am are just the facts. Can You OD on Energy? There’s a new drug on the market…and it’s as old as coffee. That’s because the new drug is caffeine! It seems that there are a whole slew of new products on the market that promote energy and sustained physical and/or mental activity and they all feature caffeine as a key ingredient. But these new products are apparently leading Americans to an alarming public health development: a rash of thousands of overdoses and reports of addiction and withdrawal…and sometimes even deaths…related to caffeine! In the United States, 85 percent of people are estimated to consume caffeine at least once a day. This number includes children under age 18 who mostly get their caffeine in sodas. Even preschoolers are ingesting it, with the likely culprit being chocolate milk but in recent years, hospitals have reported an uptick in cases of caffeine overdose in emergency rooms and nearly two-thirds were in children 18 and younger. The most dangerous problems appear to come when people use the pure powdered caffeine that is now being sold. Just add it to any drink and you’ve got instant energy. The trouble is that the difference between a safe amount and a toxic dose of caffeine in its pure powdered form, is very small and a safe amount can be almost impossible to measure accurately. But remember when you were a young rambunctious child and your parents tried to wear you out during the day so you and the rest of your family could get some sleep in the evening? The big question for me is, why are kids taking caffeine anyway? A cup of coffee or a can of soda is one thing but powdered caffeine??? What for? And It’s gotten so bad that, would you believe, “caffeine withdrawal”, is now a bona fide mental health disorder! So parents beware! It’s great for you and your children to feel energetic and to always be ready for that brand new day but as in all things American these days it seems that it is always possible to have too much of a good thing no matter the thing and no matter how good it already is…including energy! Best to just stick to finding your energy in natural places and in natural forms and foods…and if you can’t find your get up and go…just get up and go take a nap. Are you aware that if a Republican is elected to the presidency of the United States this time around, and if the current majorities in the House and Senate are maintained, then along with the Supreme Court…the Republicans will have scored a perfect government quadfecta?! If that happens then get ready for smaller government with a much Bigger Brother because there will be no checks or balances…just smooth sailing from the White House to the Courts for whatever agenda the Republicans wish to put forward. Say goodbye to civil rights and women’s rights and human rights too…except for the kind that Jesus would want you to have…like the right to judge your neighbor, starve your other neighbor’s children, leave your homeless neighbor’s in the streets and make war on your far away neighbor’s. You know…all of the things that Jesus would want…except of course from what we can read and know about Jesus’ teachings, Jesus wouldn’t want those things at all. But for many Born-agains and the Christian right, it is believed that Jesus would (inexplicably) want all of those things, along with a religiosity to our government akin to the Islamic Sharia law that rules many Islamic countries and makes every Christian cringe in fear that something like it may come here…and that was exactly what our Founding Fathers were doing their best to prevent from happening with their creation of the Constitution: Freedom for all to live as they please with or without their own religion and without having one imposed upon them by the government…Go figure! So beware the Quadfecta for it comes!…maybe… And if it does, get ready to praise Jesus and pass the ammunition.